It seems you are never too young to enjoy a day at the spa. At least that`s what the Baby Spa in Kensington, London believes. The spa`s clientele are fresh faced with soft peachy fluffy kissy skin. Cause they are babies. Based on a lifetime of working with children, Laura Sevenus has created the world’s first Baby Spa about 3 years ago– a safe, relaxed environment where your baby can develop and be well prepared for a lifetime of adventures in the water. This adorable service has been creating quite a buzz in London and has quickly become a posh destination for uber-spoiled babies. The towels are oh-so fluffy and the massage menu seductive, with its promise of an one-way trip to planet bliss among 7th heaven. Welcome to Britain` first baby spa, where some privileged, peachy-skinned, silky-haired tiny tods come to kick off the nappy and wipe off the griping, winding and weaning stresses of the day. Oh Oh Oh. When I first heard and read about this baby spa, I thought Laura must be a genius alive. I mean how cool is the idea of letting your newborn experience sensory floating and gain confidence in the water from as young as 2 days. I immediately wanted to try it out with Sasha, and have him swim, relax and take a well-deserved massage with grapeseed oils from South Africa to keep gentle skin soft and moisturized. In other words, pamper pamper pamper. 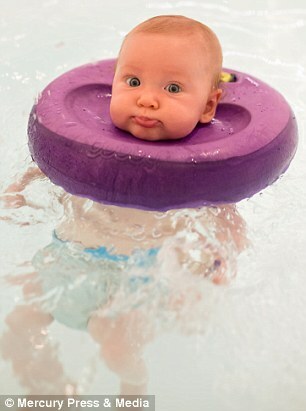 Founder Laura Sevenus, 70, even invented a flotation device, known as a Bubby, which clips around the back of a baby’s neck and supports their head while the water buoys up their body, allowing babies an indulgent, ‘hands-free’ floating experience. She’s convinced that a half-hour session in the temperature-controlled, purified waters have a raft of therapeutic effects, helping babies sleep and even tackling typical baby ills such as colic. When they notice that the baby is ready to come out of the warm water, they will remove the Bubby and wrap him in soft, warm towels, heated accordingly to the baby`s age in weeks. How cool is that ? Not even WE receive this kind of special treatment at the spa. Whateva. So, for a fair price of GP 60, your tod can enjoy a personalized bath and you can enjoy a quiet day, evening and night with your calm and purified progeny. I for one, can`t wait to try it out!